When you think of Massachusetts, stretch your imagination beyond Boston, Concord, and Lexington. Sturbridge is in the central area of the state and is beautiful and rich in history as well. I flew into Hartford, Connecticut and had a scenic ride due north. It was a wonderful visit with the Massachusetts Daughters and I enjoyed learning about all their achievements and goals. State Regent, Holly Blair has planned a visit to Hillside School next May. Watch for details. 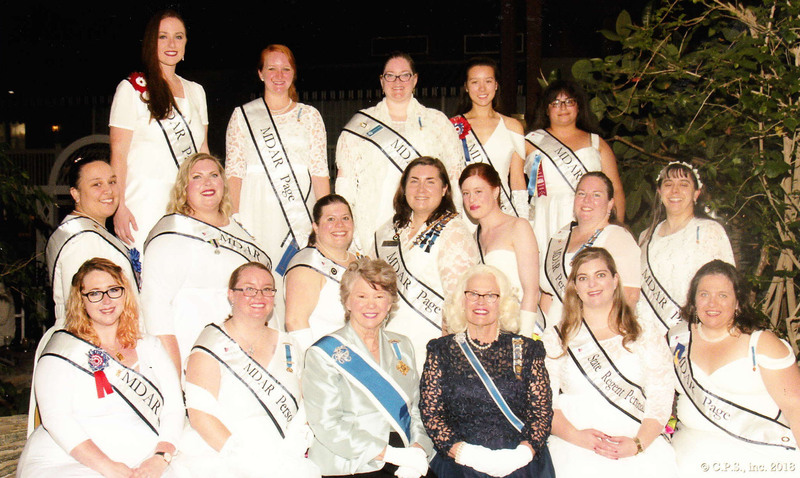 There are many good things about being a State Regent, especially if the objectives of our society afford her the pleasure of learning more about the individuals in her state membership, and the opportunity to watch them grow. As Massachusetts Daughters began to arrive on Thursday afternoon, September 13, for our semi-annual casual meet and greet, the atmosphere was full of excitement with the anticipation of welcoming our special guest President General, Ann Turner Dillon to our 2018 Fall State Meeting. Additional special guests in attendance were Alice Ridgway, State Regent of Connecticut; Kathryn West, State Regent of Kansas, and Karen Stroever, State Regent of New Jersey. Friday September 14, began bright and early as Mrs. Dillon was welcomed to our state at a breakfast given in her honor. The morning business session was highlighted by the graduation ceremonies for both New Members and New Horizons graduates, presided over by myself, our President General, and our state coordinators, Carolyn Nutt, State Chair of the Chapter Development and Revitalization Commission, and State Vice Regent, Paula Renkas, respectively. This State Regent could not be prouder of the Massachusetts Daughters who have taken time away from their busy lives to become more informed members and stronger leaders for our society. The afternoon session focused on Historic Preservation with Caroline Bigelow, State Historic Preservation chair and this officer. In using our national society’s objectives during the three- year term, the State Regent’s Projects of the Blair administration have successfully raised funding for Hillside School special projects and scholarships and provided the women veterans of Trust House, in Jamaica Plain, MA with new mattresses, box springs and bedding. This Fall Meeting announced the State Regent’s final project for raising funds to support various aspects of the DAR Forest in Goshen. As a means to allow all of our members an opportunity to participate in charitable events, this officer has included an additional project at each Spring Conference and Fall Meeting, “Women Helping Women”. Past projects for Women Helping Women, Massachusetts daughters have contributed ladies’ business attire to Dress for Success, hundreds of handmade bags and stuffed animals to Bear with Me, and announced at this Fall Meeting: “The Four P’s”, a project led by Meg Maise, Junior, Page, and State Project Patriot Chairman, to collect provisions, phones, printer ink cartridges, and pennies. (Yes, they add up!…$306.44 was collected). These items will go to “Operation Troop Support”. Following the Heritage & Founders club Tea hosted by President General Dillon, and a well-deserved break, members gathered for photographs by the DAR Convention photographer, Marshall Karesh, and soon retired to the Banquet room for the evening’s celebration. In honor of Mrs. Dillon’s visit, Constitution Week Committee Chairman, Cathryn Frienze, expertly recited Longfellow’s poem, Paul Revere’s Ride – Paul Revere’s lantern being the inspiration for State Regent’s official pin – and the ladies of the MDAR State Chorus, led by Cathryn’s sister, Cindy Krauss, entertained our special guests with a song about each of their respective states. President General Dillon’s keynote speech was the pinnacle of the evening, and on more than one occasion members were overheard discussing how inspirational Mrs. Dillon’s words were. The President General was honored to receive from MDAR a silver charm in the form of the Old North Church, and a donation to the President General Project. Mrs. Dillon also received a certificate from the Massachusetts State Senate in honor of her service to the National Society. Though we said goodbye to Mrs. Dillon during our Saturday morning business session, we were pleased to recognize some of our MDAR daughter’s achievements. The Vietnam War Commemorative Award for the Commonwealth of Massachusetts was awarded to Joan Powers for her truly outstanding service to veterans. MDAR boasts two winners of the American Heritage Contest, both in photography; first place winner, State Photographer, Karen True, and third place winner, Past-State Photographer and State Corresponding Secretary, Patrice Hatcher. In addition, Colonel Timothy Pickering Chapter member, Emily Smith, placed first for her essay on Women’s Issues. Congratulations Ladies! We are so proud of your achievements. Special thanks to the ladies of District V for providing the decorations for the entirety of our 2018 Fall Meeting along with particular appreciation to State Assistant Treasurer, Jackie Holmes, and her work with CAR to provide more than 200 hand crafted placemats by CAR members to commemorate Mrs. Dillons visit to Massachusetts and honor both our active service people and our veterans. Our special honoree to close out our last Fall Meeting of the Blair Administration was Marine Veteran and community service powerhouse, Robert “Bob” Charland. Mr. Charland was presented with an Outstanding Community Service Award from MDAR for his seemingly limitless ability to give back to his community in and surrounding Springfield, MA. Mr. Charland initiated the non-profit group, “Pedal Thru Youth”, and along with his team of volunteers, has repaired and delivered over 1000 bicycles to the area neighborhoods and schools. He is also actively involved in collecting items for area women’s shelters, and his contributions to our community continue to provide undeniable proof that one person with an idea can make a difference! Together, we truly do light the path, and Massachusetts Daughters are lighting the path daily! This week marks the 75th anniversary of the Fifty-Third Continental Congress which was held in New Y... 2 days 12 hours ago.